As luck would have it, the very first vegetarian main I trialed for Thanksgiving was such a winner that I did not need to attempt others. This aubergine and lentil pie hits all the right notes: it is hearty and savory without being heavy, and it’s a touch exotic yet wholesome enough to complement a traditional Thanksgiving dinner. It is also beautiful and can be cooked the day before you intend to serve it without losing any flavor or texture upon reheating. (I even thought the flavor improved after a day.) It is exactly what I was looking for – something special, festive, and autumnal for the vegetarians at the table. 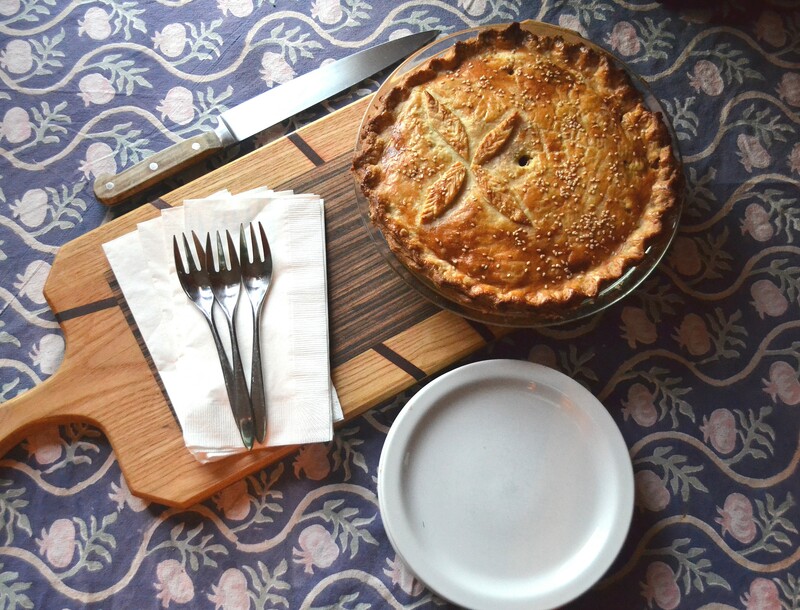 This pie is adapted from a recipe in Dan Lepard’s excellent home baking book, Short and Sweet. I have changed the spicing of the pie’s filling from Lepard’s original, but he deserves credit for the inspiration, the proportions, and the marvelous crust. Cookbooks are gifted to me so often that buying them for myself feels like a self-indulgent luxury – but, having cyberstalked Lepard’s excellent recipes on Twitter since the book’s publication, I was easily able to rationalize the purchase of Short and Sweet. I cook from cookbooks too infrequently. Recipes that don’t work frustrate me, but, from a good cookbook, one can learn so much about technique, flavor profiles, history, and food culture. So here’s the technique in Lepard’s recipe that I learned: adding just a smidgen of baking powder to the shortcrust recipe. (To those of you who already know this trick, I salute you.) I was surprised by and dubious about the instruction, but when I Googled it I learned that baking legend Rose Levy Beranbaum uses this trick too. She says, “The baking powder lifts and aerates the dough slightly without weakening it, but it also makes it seem more tender.” This, in fact, is exactly what I found. The crust was gorgeously flaky and tender, but held its shape, and stood up to the filling without becoming soggy. And even after a few days (I brought this pie to work for lunch for most of last week), the crust was neither tough nor wet. It was perfect. It is easiest to make a shortcrust pastry in a food processor using the blade attachment. If you don’t have one, you can still make excellent shortcrust using a pastry cutter or two forks, which is what I did in London. My friend Suzie, a terrific cook, says she likes to grate ice-cold butter into flour using a cheese grater. I love the ingenuity of that. Happy Thanksgiving! Prepare the pie crust enough in advance of baking to allow the dough to chill for at least an hour. Whizz flour, dry mustard, baking powder and salt in food processor, or whisk together in a bowl. Add the cold butter chunks one by one, pulsing until mixed to a fine crumb. (If making this dough using a pastry cutter or two forks, mix the butter in gradually). Dribble in ice water, pulsing just until the dough adheres together into a ball. Remove from processor and divide into two roughly equal disks if desired – this makes it easier to roll. Immediately wrap dough and refrigerate for at least an hour. Peel strips of skin off the aubergine in stripes, leaving about half the skin on for color. Cut into one-inch cubes, and toss with one teaspoon salt and paprika. Leave to sit for about fifteen minutes. Meanwhile, bring the lentils, bay leaf, and four cups of water to boil. Once the water has reached a boil, time ten minutes, then remove the lentils from heat, drain them, and put them in a large bowl. Heat about a quarter cup of olive oil – you want a generous amount – in a heavy bottomed skillet over medium high heat, and fry the eggplant cubes in batches (you should have no more than a single layer in the pan, for even cooking), until golden brown and tender, adding additional oil as needed. Remove from the pan with a slotted spoon to a paper-towel-lined plate to soak up some of the oil, then transfer to the bowl with the lentils. In a clean pan, fry the spices until the mustard seeds start to pop, then stir in the shallots, garlic, and chili pepper. Cook, stirring frequently, just until the garlic has started to soften but not brown. 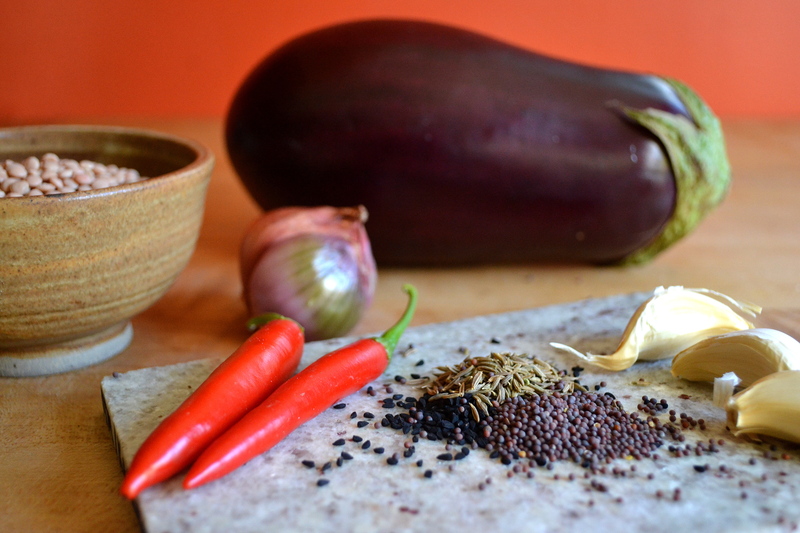 Dump the sizzling spice mixture over the eggplant and lentils. Stir in the remaining salt, tahini, yogurt, and zest. Roll out the pie dough into two disks (I like to do this on parchment paper that I have dusted with flour), one large enough to comfortably fit in a nine-inch pie dish for the base of the pie, and a slightly smaller one for the top of the pie. Line the pie dish with the base, scoop in the filling, smoothing to fill the pan evenly, brush the rim of the pie base with a little water to help seal the pie, then cover with the top crust. Trim any excess dough (reserving a bit, if you wish, for decorations), and crimp the edges. Brush the top crust with the egg wash and dust with sesame seeds. Cut a hole in the middle of the pie or slash the top to allow steam to escape, and bake for 40 minutes, or until golden brown. Makes 6-8 main dish sized portions. 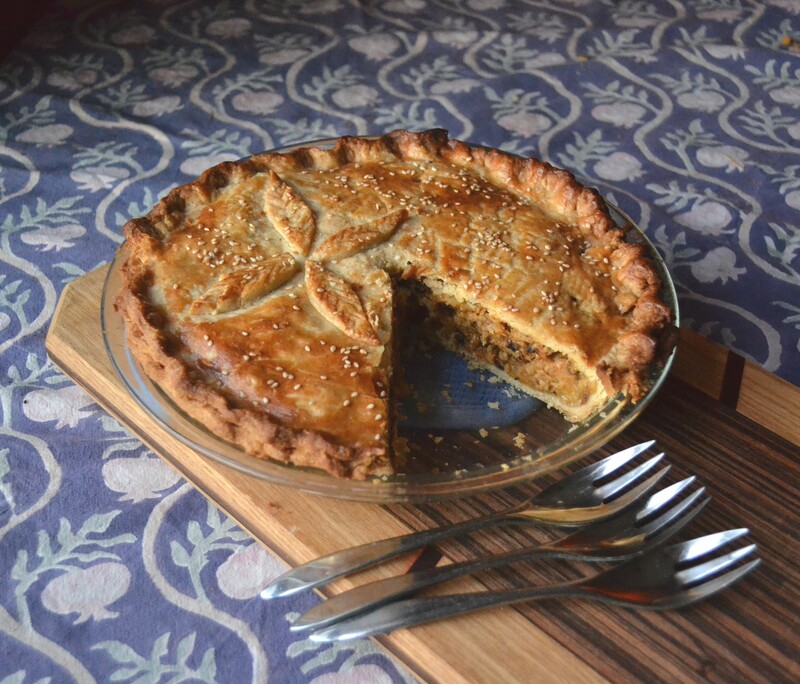 This entry was posted in Main Dishes, Recipes, Vegetarian and tagged Aubergine, Christmas, comfort food, cumin, Eggplant, Garlic, Lentils, Nigella seeds, Photography, pie, sesame, shallots, tahini, Thanksgiving, vegetarian by Susan. Bookmark the permalink. Not only is this pie gorgeous, the filling sounds wonderful as well. Love all of the spices in it! I really don’t care for eggplant (I know, I know… it’s stupid). But if that pie was on the Thanksgiving buffet, I’d definitely get in the vegetarians’ line. Color me impressed. You hit it out of the park! Simple, yet elegant and very festive. It’s special and doesn’t come off as an afterthought like so many vegetarian options do on holiday feasts. Good work! It looks very delicious! How much time did you need for this pie?